On December 22nd, 2017, President Trump signed into law the Tax Cuts and Jobs Act, putting in place permanent corporate tax cuts and temporary individual income tax cuts disproportionately benefiting wealthier households. In total, the law will result in a nearly $1.5 trillion increase to the federal deficit over ten years, likely forcing deep federal budgetary cuts in the near future. [i],[ii] Making matters worse, this act could also result in a loss of state revenue, as Montana’s tax code links to changes in the federal law. Montana lawmakers can and should respond to federal actions to mitigate any loss of revenue to the state. The federal tax bill also injects uncertainty on how taxpayers may respond to the changes, which could also impact state tax decisions and revenue. Furthermore, Montana’s ongoing budgetary crisis and the fact that the federal Tax Cuts and Jobs Act is heavily tilted toward the wealthiest households are reasons for state policymakers to continue to look at tax fairness measures that will ensure adequate revenue to maintain services for communities across our state. In general, the federal tax plan puts in place permanent and deep cuts to corporate tax rates, while providing only temporary and modest tax cuts to most individual taxpayers. Individual Montana Taxpayers Receive Modest Tax Cuts at First, but Tax Hikes in Later Years. The law temporarily lowers individual incomes tax rates, expands the child tax credit, increases the standard deduction, and scales back several itemized deductions. The bill permanently modifies how tax brackets are adjusted for inflation by using a less generous inflationary rate. This change will result in most people paying more in taxes in later years. The federal savings are used to partly pay for the permanent corporate tax cuts over time. Factoring in all changes to individual income taxes, in 2025 (when most of the bill’s provisions would be in place), households with income over $1 million would see a tax cut of an average of $25,000. While middle-income households will receive a modest tax cut initially, by 2027, when many of the provisions expire, many middle-income families will be facing a tax increase. Those at the top would still be receiving a tax cut. (see figure on page 1). Several provisions of the new federal law will significantly lower federal taxes on corporations, and some of these changes will also impact state revenue. The largest tax cut on the federal level comes from a reduction to the federal corporate tax rate, from a graduated income tax with a top rate of 35 percent to a flat 21 percent rate. [vii] This rate change will not affect Montana’s corporate income tax rate. One measure that has garnered significant attention on both a federal and state level is a new deduction for taxpayers with income from pass-through entities, such as partnerships or limited liability companies (LLCs). A taxpayer that is an owner in a pass-through entity and has income from that pass-through will now receive a deduction on the owner’s individual income tax. The deduction is calculated looking at the pass-through income claimed by the owner. [xiii] The new federal law limits the deduction for higher-income pass-through owners by tying the deduction to a percent of wages paid by, or physical property owned by, the business. Taxable income: calculated by first taking a taxpayer’s income and subtracting allowable tax deductions. Tax credit: a tax benefit that directly reduces a taxpayer’s taxes owed. Tax deduction: a tax benefit that reduces a taxpayer’s taxable income. Pass-through entity: a type of business entity that is not taxed at the business level, but instead, the business income is passed through to the owners and taxed on an individual level. Pass-through entities include partnerships, certain corporations with a smaller number of shareholders (S-corporations), and limited liability companies (LLCs). Partnership: a type of business owned by two or more partners, where profits and losses of the business are divided among and passed through to the partners. While Congress included some sidebars on when this new deduction can be taken, there are significant questions as to whether these changes on a federal level will change taxpayer behavior. For example, some high-income workers may be inclined to shift their status from an “employee” to an “independent contractor”, organized as a pass-through entity, to take advantage of the new deduction. The extent to which this change in behavior may occur is unclear, but potential shifts toward greater pass-through income could impact state revenue collections. While state officials have indicated the federal deduction will not be applied on the state level, state policymakers can and should take action to ensure this is clear in state law. While an initial analysis by the Montana Department of Revenue indicated that the new federal deduction may also apply on the state level, the Department’s final analysis (and consistent with an analysis of by legislative services) has stated that Montana’s state tax code does not require the state to provide a similar deduction on the state level. However, the governor and legislators should consider policy changes to make it clear that this deduction is not allowed. For partnership owners, more than three-fourths are non-resident individuals or out-of-state business entities. 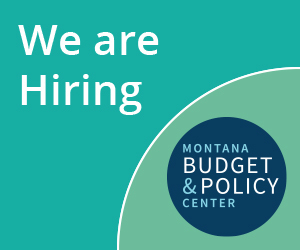 Nearly all of the Montana income derived from partnerships comes from the wealthiest four percent of partnerships (with incomes in excess of $5 million annually). [xvi] Pass-through entities within the financial sector make up one of the larger sectors (by income level), with more than half of their income (over $35 billion) derived from capital gains. [xvii] Taxpayers with ownership in these businesses benefit from the state capital gains tax credit, which taxes capital gains income at a lower rate than income earned from wages. Thus, many of these entities will now also benefit from an additional federal deduction on the same income. Montana should discuss state policy changes to pare back the capital gains tax credit. Modifying expensing rules for corporations. Many states have already decoupled from federal expensing rules. For example, Idaho requires a business to add back the federally-allowed bonus depreciation in calculating the business' state taxable income. For purposes of calculating taxable income for a corporation, Montana can and should require corporations to add back the accelerated depreciation for state tax purposes. Maintaining (or even lowering) the current income phase-out levels for itemized deductions. Under prior federal and Montana law, itemized deductions are phased out at higher income levels. Congress eliminated these phase-outs in the federal tax bill. Montana could reinstate or consider lower phase-outs for purposes of itemizing deductions on a state level. Clearly decoupling from the new federal deduction on pass-through income. While this deduction is not allowable on the state level, policymakers could think through state tax changes to ensure this disallowance is clear in law. Adjust the state corporate minimum tax for inflation, which is currently set at $50, and has not been updated since 1965. Overall reduction in federal taxes paid Montana provides a state deduction for federal taxes paid, but that deduction is capped. A reduction in federal tax paid will result in a slight reduction to the total state deduction taken. Eliminate phase-out for itemized deductions Montana links its itemized deduction rules to the federal levels, so some individuals will now be afforded a greater itemized deduction on the state level as well. Capped federal deduction for state and local taxes paid Montana links its state deduction for property taxes to the federal, so the new cap will impact a very small percentage of taxpayers with property taxes in excess of $10,000 annually. Eliminate ACA individual mandate Montana imposes a tax on insurance companies for individuals enrolled in the health insurance marketplace. Fewer individuals enrolled in the marketplace will reduce state insurance taxes paid, but this may be offset slightly by individuals required to pay higher premiums on the marketplace. (2) expanding the list of property eligible for the expensing Montana links to the federal business expensing rules, so this will result in faster expensing (and thus lower total taxable income) for state tax purposes as well. Eliminate federal domestic production deduction for corporations Montana links to the federal domestic production deduction, so this will result in a slight increase to taxable income. Modify limits on corporate interest expense deduction Montana links to the federal interest expensing rules, so this will result in a slight increase to taxable income. Shift to “territorial” corporate income tax system Montana currently requires combined worldwide reporting which does not change. However, Montana has not updated its list of tax haven countries for corporate taxpayers electing water’s edge election, and this could result in continued loss of reportable income on profits housed offshore in certain tax haven countries. [i] “Estimated Budget Effects of the Conference Agreement for H.R. 1, the ‘Tax Cuts and Jobs Act.’” Joint Committee on Taxation. December 18, 2017. https://www.jct.gov/publications.html?func=startdown&id=5053. [ii] Huang, C. “GOP Budgets, Statements Make Plans Clear: Costly Tax Cuts for Wealthy Now, Program Cuts Later.” Center on Budget and Policy Priorities. 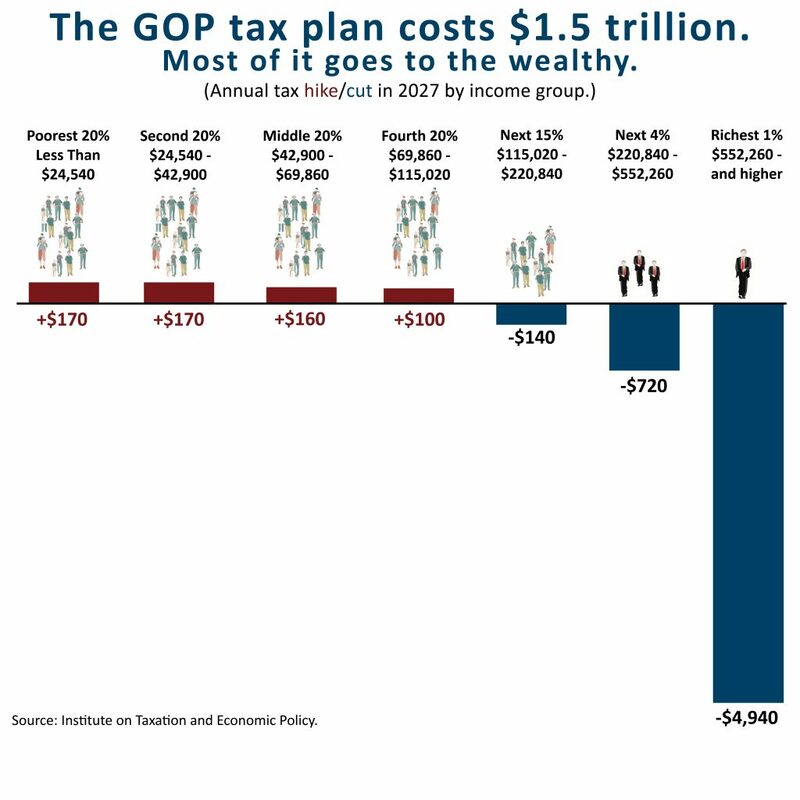 December 5, 2017. https://www.cbpp.org/blog/gop-budgets-statements-make-plans-clear-costly-tax-cuts-for-wealthy-now-program-cuts-later. [iii] “Estimated Budget Effects of the Conference Agreement for H.R. 1, the ‘Tax Cuts and Jobs Act.’” Joint Committee on Taxation. December 18, 2017. https://www.jct.gov/publications.html?func=startdown&id=5053. [iv] Congressional Budget Office. “Repealing the Individual Health Insurance Mandate: An Updated Estimate.” November 2017. https://www.cbo.gov/system/files/115th-congress-2017-2018/reports/53300-individualmandate.pdf. [v] Center on Budget and Policy Priorities. “How Does the Final Republican Tax Bill Affect Your State?” December 19, 2017. https://www.cbpp.org/research/federal-tax/how-does-the-final-republican-tax-bill-affect-your-state?utm_source=The+Federal+Scoop&utm_campaign=98ecebff54-EMAIL_CAMPAIGN_2017_12_22&utm_medium=email&utm_term=0_e3f339ce06-98ecebff54-111146177. [vi] Memorandum from Department of Revenue Director Kadas to Budget Director Villa. “Federal Tax Reform (HR 1) Impacts to the State’s Budget.” December 22, 2017. On file with author. [vii] “Tax Cuts and Jobs Act” Pub. L. 115-97. December 22, 2017. https://www.congress.gov/bill/115th-congress/house-bill/1. [viii] “Tax Cuts and Jobs Act” Pub. L. 115-97. December 22, 2017. https://www.congress.gov/bill/115th-congress/house-bill/1. [ix] Montana Department of Revenue. “Biennial Report: July 1, 2014 – June 30, 2016.” December 13, 2016. [x] “Tax Cuts and Jobs Act” Pub. L. 115-97. December 22, 2017. https://www.congress.gov/bill/115th-congress/house-bill/1. [xi] “Estimated Budget Effects of the Conference Agreement for H.R. 1, the ‘Tax Cuts and Jobs Act.’” Joint Committee on Taxation. December 18, 2017. https://www.jct.gov/publications.html?func=startdown&id=5053. This includes the increase to the section 179 expensing, and the extension, expansion, and phase down of bonus depreciation rules. [xii] Memorandum from Department of Revenue Director Kadas to Budget Director Villa. “Federal Tax Reform (HR 1) Impacts to the State’s Budget.” December 22, 2017. On file with author. [xiii] “Tax Cuts and Jobs Act” Pub. L. 115-97. December 22, 2017. https://www.congress.gov/bill/115th-congress/house-bill/1. [xiv] Montana Department of Revenue. “Biennial Report: July 1, 2014 – June 30, 2016.” December 13, 2016. [xv] Montana Department of Revenue. “Biennial Report: July 1, 2014 – June 30, 2016.” December 13, 2016. [xvi] Montana Department of Revenue. “Biennial Report: July 1, 2014 – June 30, 2016.” December 13, 2016. [xvii] This information reflects updated information received by the Montana Department of Revenue. Memorandum from Montana Department of Revenue to Heather O’Loughlin: Individual and Corporate Income Tax Questions. January 18, 2018. On file with author.